When I heard that this anime had a yuri love confession, I knew I had to watch it, but what I didn’t know was how much I’d actually end up liking this show. It’s not the cutest or the most charming anime, but it is still pretty fun. Synopsis: The anime centers on Kohane Hatoya, a young woman who loves to be helpful to others. After she moves from middle school to high school, she becomes fascinated with cheerleading, and she starts a cheerleading club at her high school. Joining Kohane in her cheerleading activities is the experienced Hizume and Kohane’s childhood friend Uki. As expected, an anime about cheerleading doesn’t have much in the way of story. Despite involving sports and mostly taking place in school, there are no clubs to save, no unrealistic desire to become the best in the country or anything like that. It’s basically just about a group of girls that enjoy—or come to enjoy—cheerleading, and while that doesn’t sound terribly exciting, the show manages to get by with a surprising amount of charm. As I briefly mentioned earlier, I liked how the girls of the cheerleading association/club don’t magically transform into one of the best teams in the country, similar to how you’d find in other anime such as Saki. To them, it’s all about having fun and doing something they all enjoy, and I think that’s kind of refreshing. From Kohane’s love of cheerleading at first sight and the inception of the cheerleading association all the way to the club’s ouster at the prelims of the tournament, “fun” is a word that comes to mind a lot regarding this anime, and while I don’t think the comedy can’t match that of some other yuri-ish comedies, this is still a show that is pretty funny. Anime involving cute girls doing cute things rarely results in a compelling story—and Anima Yell! is no exception—but that doesn’t mean it can’t be an enjoyable experience, and that’s what this show ended up being, despite the low story score. Despite the weak story, I think where this anime redeems itself the most is with the characters, who ended up being more enjoyable than I expected. As is often the case for little pink-haired girls, Kohane is a bundle of wholesome energy, and in an anime season that saw a lot of good characters, she was probably one of my favorites. Adorable, funny, and charismatic, she played a huge part in my overall enjoyment of this anime, and you know who else greatly appreciated Kohane? Uki. Yes, Uki x Kohane was probably one of my favorite things about this show, and since Kohane is pretty dense and oblivious, she doesn’t even realize how much of a crush Uki has on her. When she’s not perplexed by Kohane’s unique thought process, Uki actually does an okay job of hiding her interest in Kohane, but—and stop me if you’ve heard this before—there aren’t enough cute moments between them, and unlike Ushiku, Uki isn’t always so desperate for Kohane’s affection/attention. 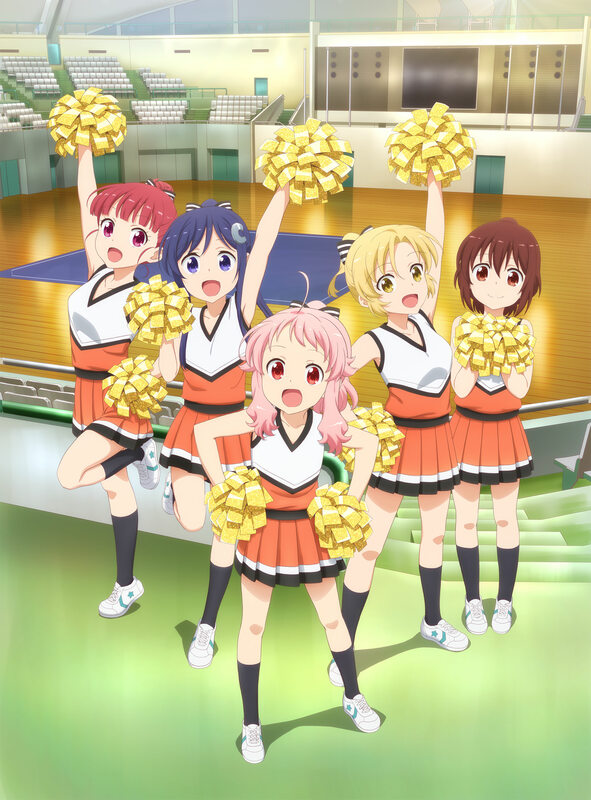 Kohane’s newfound love for cheerleading comes when she spots Hizume performing a routine, and after some convincing from Kohane, Hizume’s love of cheerleading helps her overcome her fear of being alone, so she joins Kohane in the newfound cheerleading association. That fear of being alone is one of Hizume’s most endearing traits, and her cheerleading expertise makes her this sort of teacher and mentor for Kohane and the other girls of the club. That said, she isn’t always in serious mode, so she’s kind of the best of both worlds, a demanding leader and a super cute worrywart. In episode three, we see the girls help a classmate of theirs who plans to confess to her college-aged tutor, and it just so happens that her tutor is a woman. It’s a nice and refreshing touch, even though we don’t really see the confession itself. So with Kohane, Uki, Hizume, Ushiku, and Kotetsu, the cast offers a lot of personality and charm, and there’s also a decent amount of subtext to go along with this entertaining group of girls. Coming from Doga Kobo, it’s no surprise that this anime isn’t exactly a looker. Cute is what this studio does best, and Anima Yell! is no exception. The sports genre tag is kind of misleading, since the girls’ cheerleading routines are more suited for beginners like Kohane, so there aren’t many opportunities for fancy acrobatics or anything like that. All in all, this generally looks just like your typical slice of life anime, and while that’s certainly not great, it doesn’t really matter. As for the sound, the music didn’t really stand out to me at all, so I’m drawing a blank here. The routines often favor chants more than music, and in the rare cases where we do get an insert song, they’re not anything that especially sticks with you. Going into it, my expectations for Anima Yell! were honestly pretty low. Upon first glance, it looked to me like another below average cute girls doing cute things anime, but you can’t measure heart in a PV, and this modest little anime has a lot of it. Overall, the girls, the comedy, and the yuri all combine to form one cute and entertaining anime that might end up surprising people that give it a chance. This entry was posted in Anime, Anime Review and tagged Anima Yell! by Rock The Vogt. Bookmark the permalink. Kohane was pretty fun, but I didnt got motivated to finish the series. Maybe I suffered from cute ggirls fatigue. Will give it another try when Im cured. This was a surprise for me as well, checked it out based on your review and was not disappointed. Thanks for that. Overall it was really well put together. The pacing was just right, it added characters and developed them just when it should, and just did the best it could without going over the top (much like the storyline itself). Plus the yuri confession that no one batted an eye lash at, and all the wonderful subtext just made for a really fun watch. Plus how often do you get an actual mention of yuri in anime? They must know who their intended audience is and are catering to them. +10 brownie points. 1. This page: the graphic for Hizume’s character is missing title text like the others. 2. Anime Winter Season 2019: First Impressions: last paragraph of Boogiepop “horror anime that’s come out way in recent years”, the ‘out’ should probably be an ‘our’? 3. Tonari no Kyuuketsuki-san: Towards the end in the audio section “As for the audio, it’s mroe or less” ‘mroe’ should probably be ‘more’?